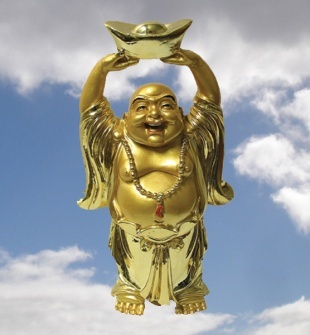 The Happy Fat Buddha: A Representation of Maitreya Buddha’s Blessings | Sana Ako si Ricky Lee! Happy Fat Buddha or Laughing Buddha, as he is famously called by non-Buddhists, is undoubtedly one of the most famous and recognized image of a Buddha. The Happy Fat Buddha is in reality not a Buddha, at least, not yet. He is currently a Bodhisattva and a future Buddha who’ll replace the existing Historical Buddha which is Gautama Buddha or Sakyamuni (also spelled as Shakyamuni) Buddha. The Happy Fat Buddha or Laughing Buddha is in reality known as the Maitreya Buddha. Buddhist scriptures states that we are currently under the ‘era’ of Sakyamuni Buddha, which is the fourth Buddha to have appeared on earth, there have been 3 others before him. It is said that his arrival will be at the time of the low point of human existence. He will come at a time where in mankind has forgotten about the Dharma (Buddhist teachings). This is not totally impossible because as shown in what is happening in Tibet, under the rule of China, the original Dharma is being purged and destroyed, albeit with extreme resistance from Tibetans and other Buddhists, but unfortunately, still with a lot of success. This answers why even after several recitations of Mantras it is still bound to happen, because it was prophesied in the Buddhist scriptures. In China, Buddhism has really taken a lot of different interpretations that are watered down. Buddhism, as any other religion in China, is closely monitored and censored by the government. Same thing is currently happening in other parts of Asia, such as Myanmar. Going back to Maitreya Buddha or Happy Fat Buddha as he is normally called, is said to come when mankind is in need to be reminded of the Dharma. At present Maitreya Buddha is at present said to be living in Tusita Heaven, a celestial place where celestial Bodhisattvas are said to reside. 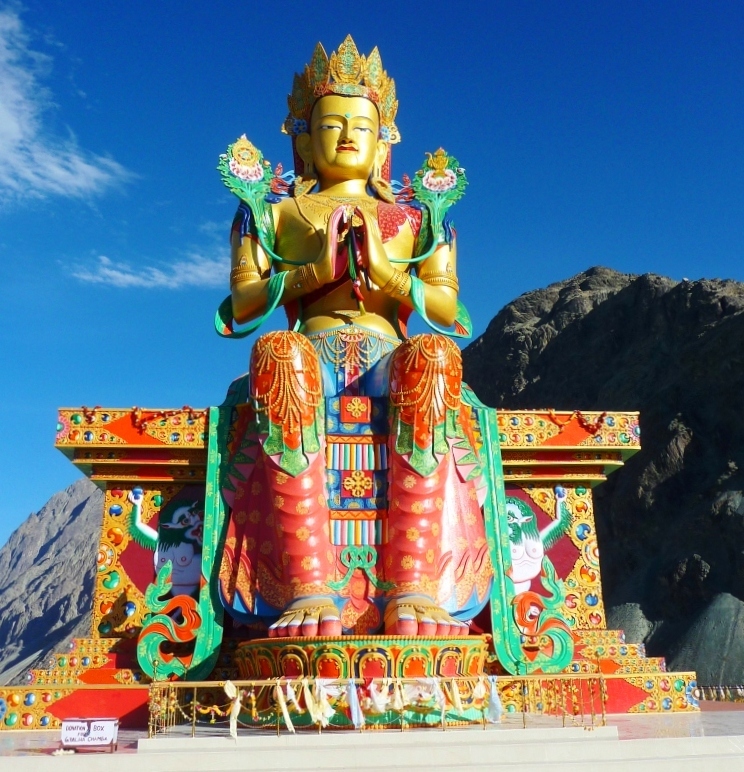 In Tusita Heaven, it is said in the Buddhist scriptures, Maitreya Buddha constantly recites mantras and sutras for us. He also continuously gets lessons in preparation for his coming to earth where he’ll achieve enlightenment within 7 days and become a Buddha so that he can impart to us the Dharma. 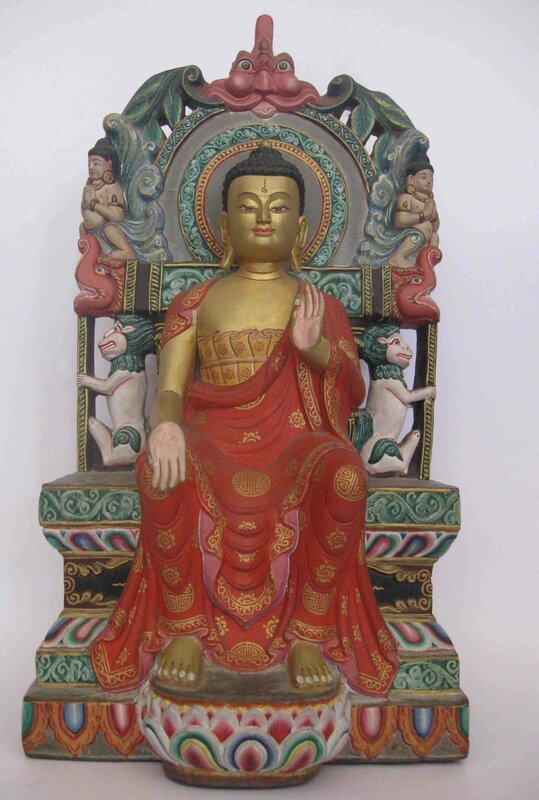 Typically pictured seated on a throne either cross legged or feet flat on the floor, signifying that he’s waiting for his time, Maitreya is originally pictured as a slim, handsome prince. He is also usually dressed as a Indian royalty (India being the origin of Buddhism). As representation of him being a Bodhisattva, it is not uncommon to see that he is also adorned with jewels. A Khata is usually tied around his waist much like a belt. Another representation of Maitreya Budda. The idea of him pictured as a Happy Fat Buddha came about of what he represents. The Maitreya Buddha represents wealth, health, love, happiness or joy, success, peace, and harmony. In short, he represents what each person aspire for. There are several stories as to why the image of Maitreya Buddha became that of the Happy Fat Buddha or Laughing Buddha. In fact, Maitreya is derived from Maitri which means Loving Kindness. 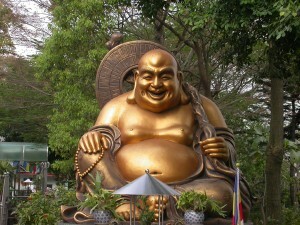 One of the story states that the image of the Happy Fat Buddha came about because of the Chinese buddhist monk Budai. Budai either claimed or people saw in him the qualities of Maitreya Buddha (the written history about this are not clear) that when he passed away people started using his image as the image of Maitreya Buddha. Another story claims that Maitreya one day visited earth to share the sutras, however, all the women are unable to absorb his teachings because all they can see is a very handsome young prince and they fell in-love with him. Seeing that his image causes women to be distracted he transformed himself to a fat bald man. Still another story is quite simple. When Buddhism was introduced in China, they’re unable to comprehend some aspect of the teachings of Buddhism. For example, Kuan Yin is a female representation of Avalokitesvara, the ‘Male’ Buddha of Compassion. However, Chinese are unable to comprehend the idea of a very loving, gentle, compassionate MALE being, to make it easier for the people to understand the character and teachings of Avalokitesvara, they decided to represent her with a female image called Kuan Yin or Kwan Sheer Yin (He or She who hears the cries of the world). Allow me to briefly share here that it is said that it is Avalokitesvara himself who instructed some Indian and Tibetan monks through a vision to represent him as Kuan Yin. This is not totally veering away from reality, because in truth, celestial Buddhist gods are androgynous, they are neither male or female, or it can be said they are both male and female. Since at that time Chinese always associates wealth and health with plumpness, and happiness, love, harmony with a happy face, these characteristics became the representation of Maitreya Buddha in China. Personally, I believe that the 3rd story is the most plausible explanation. 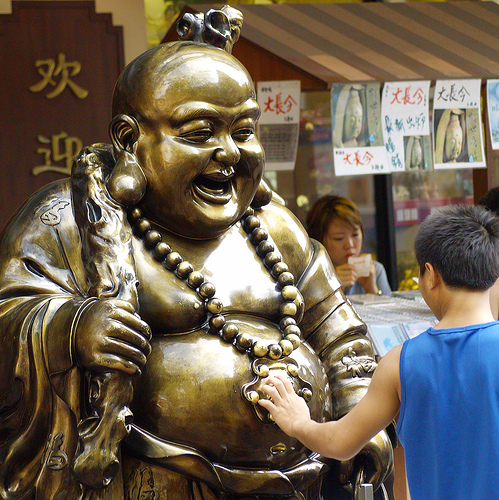 When I come across a big image of the Maitreya Buddha as a the Happy Fat Buddha or Laughing Buddha, or when I pray to him, I usually rub his stomach to signify the asking of blessing. It’s an affectionate gesture. However, never touch the head of a Buddha, because in Buddhism it is only monks, your elders or superiors who can touch the head of a person who is ‘beneath’ them. Aside from ‘Happy Fat Buddha’, ‘Laughing Buddha’, Maitreya Buddha is also called ‘Metteya’, ‘Puy Lok Yah’ (Fookien term for The Happy Fat Father), ‘Mi Lo Fu’ in Chinese, ‘Mile (pronounced as Mee-Lay) Pusa’ also in Chinese, Miroku Bosatsu in Japanese, Mireuk Bosal in Korean, Phra Sri Araya Metrai in Thai. Most of the images of the Happy Fat Buddha depicts him on a relax mode. There’s another image of him on his legs. Either of the two images are considered very auspicious. Placing the image of Maitreya Buddha, either as the handsome young prince or as the Happy Fat Buddha or Laughing Buddha helps generate his blessings of happiness, harmony, love, peace, wealth, good health, etc. However, in the Philippines it is easier to get his image as the Laughing Buddha. Also this particular image also gives a psychological effect for all those who see it. It reminds us to be happy, it reminds us to become positive, and at the very least, because of how he looks as the Happy Fat Buddha, it creates an atmosphere of happiness and harmony. You can place his image either on your altar, or any parts of your house except in the bedroom (for married couples) and or in the rest room. Wearing an image of the Maitreya Buddha as a pendant is also very auspicious and serves as an homage to him. In return, you get to tap into his blessings. 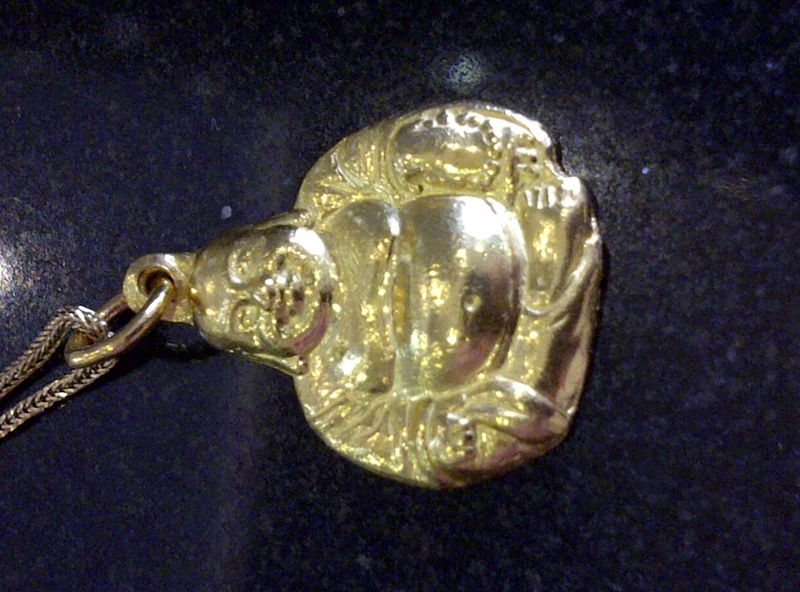 When I was designing the WISH FULFILLING AND BUDDHA’S BLESSING MANTRA PENDANT, a pendant that I initially designed for myself and for my family but has since then become a popular charm for my readers garnering a lot of very positive personal testimonies, my frustration is not having enough space to include the image of the Happy Fat Buddha. 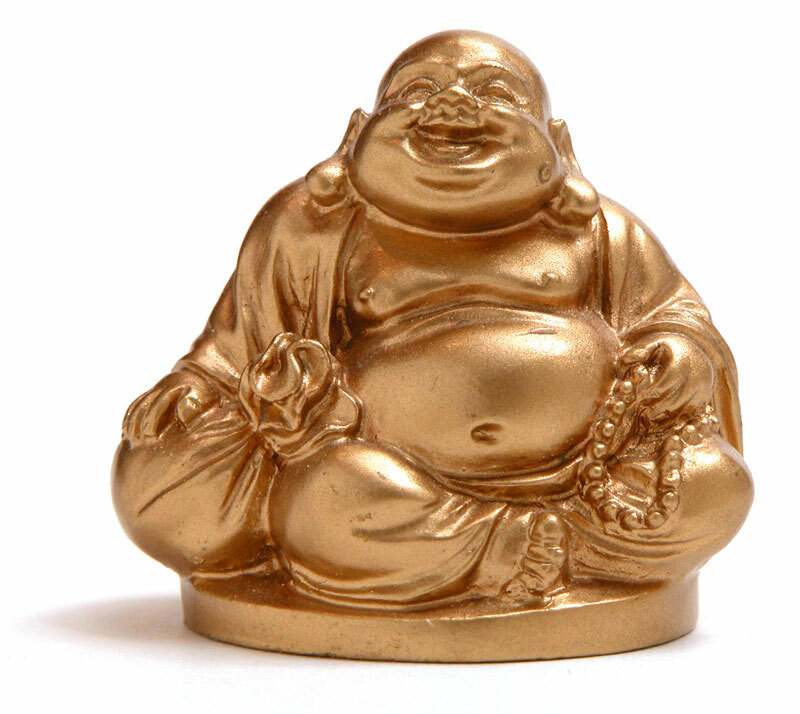 However, since I have a separate Happy Fat Buddha pendant I see no need to include. I’m just happy that the WISH FULFILLING AND BUDDHA’S BLESSING MANTRA PENDANT has since then become an instrument of good luck to a lot of my readers. NOTE: This post was edited on Dec. 2, 2013. ← Get Rid of Bad Luck! Very interesting. I love the Happy Fat Buddha and its nice to know his story. Hello Readers of this very Insightful Blog, like you I am also interested in the Laughing Buddha, and if you are looking for a pendant of this type I have the link to my Sulit, here. Thanks to the owner of this Blog here. Its quite expensive but its worth the price. Thanks. Sharing this comment with my readers. I clicked on the link and I think its a nice piece. However, please note that I don’t know the seller and won’t be able to vouch for him/her. Thanks. Thank you for sharing this w/ me and my readers. I’ve approved your comments despite of the fact that it’s obviously a marketing pitch because it’s up to my readers to decide whether they like the items being sold or not. However, please do not spam my comment section. Do not post it in all my blog posts. It’s already impolite and very inappropriate. Do not abuse the courtesy that has been given to you. can i just get a laughing buddha anywhere? i mean doesn’t it have to be cleansed first or energize through a prayer or something…please enlighten me. Yes, you can get it anywhere. While having it cleanse is advisable, it is not really necessary. Why should you not have an image in the bedroom? I’m assuming you’re referring to images of Buddhas, Bodhisattvas,etc. It is because it is deemed impolite. I recently came to know about an ongoing quest for the prophesied “Maitreya Buddha” who’d succeed Shakyamuni of the yore after 2500 years of his Parinibbana at Kushinagar, India. As a man above the organized religions and state-made frontiers, I have decided to write to various institutions, governments, legislators, foreign missions, media etc. urging a probe into my Maitreya claim in the light of the proofs furnished here. Buddhism is a standing mandate for human evolution through unflinching consciousness (consciousness is the one-word substitute for awareness and awakeness). Bearing in mind these evidences and my pace of evolution in dire straits, I think I have a better title to “Maitreyahood”. Mr. Raj Patel is a London born British Indian educated at Oxford and London School of Economics etc. whereas I was born to poor and unread parents and had a humble Hindi schooling. The starkness of this contrast alone can set me way ahead of Mr. Patel in the Maitreya run up but I think this is not enough. To support my claim I will adduce evidences which are visible and verifiable on the ground. To my knowledge, Mr. Raj Patel or others down the history have never offered such factual corroboration. Prepared with these evidences I’d also visited Varanasi in Feb 2012 and called on Mr. Sundaram of the Theosophical Society of India and also went to Mahabodhi Society at Sarnath only to encounter the characteristic Indian arrogance coupled with ignorance. Instead of receiving and examining the evidences that I had with me, Mr. Sundaram referred me to a clerk. He curtly dismissed any Maitreya possibility and ordained that Buddha is omnipresent hence no need for his rebirth. The whole meeting lasted just two minutes. The other man at “Mahabodhi” was quick to camouflage his jeers with a contrived sympathy and counseled that Maitreya’s time was still 10000 years (in words ten thousand years only) away and also that I should approach a competent Court of law with a writ petition! I was spurned perhaps because I lack the “holier-than-thou” kind of looks. For centuries the Indian eyes are adapted to crude charlatanry. How can the space age Maitreya be expected to ape Gautama of the times when people rode asses and mules? To the bigot, it is heresy for Maitreya to don à la mode attire and talk of this world. Next I may be asked to prove my efficacy in “Pali” to be seriously taken as a Maitreya candidate. Any Maitreya report would and should at first be taken as a cunning hoax particularly in case of a no-profile and “heretic” man like me. I am a gross misfit to any of the so called religions existing on earth today. This however should not prevent an inquiry if I am ready to bear all expenses related to this exploration. I want a logical end to this suspense sooner the better. I request the world community to consider the Maitreya evidences furnished here which are intelligible even to the laity. These are verifiable on the ground with the help of internet provided it’s agreed that Maitreya who is currently biding away his time in the symbolic tushita heaven is a reality, not a fiction, and also that his time is now. If Maitreya is a fiction then the various governments in India and elsewhere should not be squandering tax payers’ money on his statues and allied projects. While presenting this case I have particularly referred to Osho Rajneesh because he is evidently a credible name in the realm of spirituality. He was the foremost man in recent times who correctly understood Buddha and pitched for a pro-life religion but had to face the heat from clergy and the status quoist mediocrity. I intensely felt it at Varanasi. Certainly the persons like Osho, Madame Blavatsky, Annie Besant and J. Krishnamurthy were no impostors who went to the extent of expressing disappointment over the delay in Maitreya’s emergence. Rejection of the Maitreya prophecy is akin to discrediting Buddha’s vow made before Sariputra and the assembly of monks at Shravasti twenty five centuries ago. He had promised to return as Maitreya for the last time when his Dhamma would be completely forgotten in India. The following is merely a fraction of what I have in store as evidence. For the more prudent I have infinite supply of evidences provided I am asked for it. Please read them and draw your own conclusions. 1. My parents (now both deceased) belonged to a village called Salahabad then located in the Basti district of Uttar Pradesh province in India. The name Salahabad is the Urdu equivalent of Sanskrit Shambhala, meaning the habitat of peace (salah-peace and abad- habitat). Shambhala is scriptured as the birth place of the prophesied Kalki. In Hinduism, Maitreya is recognized as Kalki. In the year 2000 A.D. Salahabad came under the newly formed district named Sant Kabir Nagar which was carved out of the erstwhile district Basti (Basti is the distortion of ancient Shravasti). Salahabad is a poor and dusty hamlet which even today can boast of only two modern luxuries for its inhabitants-bicycles and water hand pumps. It’s among the strangest of Indian villages. (Search “kalki shambhala”). 2. According to the British archeologist A.C.L. Carlleyle’s report in 1875-76, Gautama Buddha was born in the village Bhuiladih of district Basti (U.P. ), India. Bhuiladih is only a mile away from Piprahwa and fifty aerial miles from Salahabad- my parental village where I was conceived. (Search “bhuiladih kapilavatthu”). It’s noteworthy that my late mother’s name was Bhuila. Kushinagar, the site of Buddha’s Parinibbana, is also about 50 aerial miles away from Salahabad. The Govt. of India is building a new Kapilvastu at Piprahwa much to the chagrin of Nepal. Let me update both the contending sides that it’s Bhuiladih, a mile away from Piprahwa, where Buddha was born. (Search “osho time ripe Maitreya fifty miles”). 4. I was born in the courtyard of the House No. 19-A, Street No. – 8, Sector No.-1 of Bhilai Steel Township on 28-07-1961 and nicknamed Bhikhi aka. Bhikhu. Please note that my nickname is patently Buddhist. I was enrolled for schooling by the name Kamlesh Shrivastava. “Kamlesh” literally means lord of the lotus (kamal + eesh) and “Shrivastava” can be deciphered as “the great civil engineer” (shri –great and vastav -the man of vastu i.e. a civil engineer). 5. Just prior to my birth my mother had planted a mango sapling in the courtyard of the above mentioned house and later used to tell me that I and that mango tree were of the same age. Even if that tree no longer exists, there are witnesses around to confirm this. (Search “Maitreya mother branch tree”). 6. My father died of acute pulmonary tuberculosis at the age of 42 when I was over a month short of 18. He died on 18-06-1979 following a prolonged and excruciating illness. Visit http://www.maithri.com/links/articles/metteyya/htm or any other related website where it is recorded in the scriptures that Maitreya would make the renunciation at the age of 18 upon seeing the sick, the poor and the dead. My father was all rolled into one. I had to live in mortal fear too deep and for too long before and after his death. We the four siblings and our widowed mother were in sheer insecurity and penury. I however continued with my bachelors in civil engineering and later secured a compassionate employ on ignominious terms with my father’s company after an agonizing wait. I accepted all terms and conditions of service because I was miserable then and had no time or means for career grooming at the peril of my several dependents. At that time we were in debt trap and additionally had two sisters to be married off besides looking after everyone. Perhaps an Indian can better understand the plight of poor, fatherless and unwed Indian girls with an uneducated and widowed mother. I let go of my ego and secured the compassionate job to save destitution to the fatherless siblings and widowed mother who had run the household and born my educational expenses out of the paltry sum she’d received from the company as terminal benefit upon her husband’s demise in harness. (Search “maitreya this is my last life I will live it fully”). 7. Bhilai Steel Township since its heydays in the 1960’s, has all the flora and fauna as metaphorically described by Buddha in the Sukhavati Sutta. The aptly named Sukhavati is mentioned in the Maitreya prophecy as the habitat of Maitreya (Sans. sukha means happiness). Particularly during the 60’s and 70’s this company township was somewhat like a utopian land for its resident families just as described by Gautama Buddha. To those who craved to live here, it was an oasis nestled amid hideous deserts. Company maintained western civic amenities; health, educational and recreational facilities, lush greenery, law and order etc. were of the highest quality and often comparable with world standards. Nehruvian socialism and Soviet collaboration of the company had made Bhilai Township bountiful and an almost crime free commune for over thirty thousand families. It was a unique cradle- to-grave kind of welfare system. Those were the times when India largely was very poor. India’s founding premier Nehru has on record described Bhilai as the pilgrimage of modern India. Search “sukhavati sutra” and “sukhavati western paradise”. The resulting descriptions may be metaphoric so seize the gist (satva) of the Sutra. Perhaps the tag “western paradise” for Sukhavati has brought Raj Patel- a Londoner, into the focus of a section of Maitreya zealots. Here I have endeavored to establish that Bhilai, not London, is the prophesied “Sukhavati”. 8. Bhilai Steel Township, also known in Hindi as “Ispat Nagari” (search “buddha isipatana”) has a large garden called Maitri Udyan (friendship garden) with a zoo housing all animals mentioned in the relevant sections of Sukhavati Sutta. The city also has three different private colonies namely Maitri Nagar, Maitri Kunj and Maitri Vihar. A “Maitri Stambh” (friendship pillar) also stands near the main entrance of Bhilai Steel Plant as a souvenir to Indo-Soviet friendship. Maitri means friendship while Maitreya means friendly or amicable. The company accommodation in this steel city was allotted to the employees grade wise with subcategories in three classes -executive, supervisory and the lay. (Search “western pure land sukhavati upper middle lower”). 10. I had filed certain queries with the Bhilai Municipal Corporation against the erring builder of the colony of my current rented residence under Right To Information Act. I had also complained of the flawed design and construction of the house “Lotus” which had figured in a local daily newspaper. A couple of months later I amazingly discovered that the text of my queries and the complaint put together had the tone and tenor verbatim as articulated by Buddha in his Maitreya prophecy. I have the documents as well as the clipping of the newspaper safe with me. (Search “Buddha builder of the house beam column”). 11. During that period Mr. Pankaj Gautam was the CEO of Bhilai Steel Plant where I worked. Likewise Ms. Rina Kangale and Mr. O.P. Pal were the District Magistrate and Superintendent of Police respectively of the Bhilai jurisdiction. Ms. Kangale is a professing Buddhist while Mr. Pal hails from the district Basti (U.P.). A Police Superintendent’s native place is hardly report worthy but in this case Basti was once mentioned as such at least by the daily “Dainik Bhaskar” which I subscribe to. Ms. Saroj Pandey represents Bhilai in India’s national parliament. All bold italics here are Buddha symbols. 12. Last year a new housing colony named Amrapali Vananchal City (Sans.Vananchal- Forest zone) was launched by the reputed Indian colonizers- Amrapali Group about a mile away from my current residence. Amrapali was the disciple- consort of Gautama Buddha living in her forest abode near Vaishali in the present day Bihar. “Amrapali Vananchal City”, currently under construction, is only about a mile away from a colony named “Vaishali Nagar” in Bhilai. (Search “Buddha amrapali vaishali” and “amrapali vananchal city bhilai”). The bold italics here are Buddha symbols. 14. In the year either ’89 or ‘90, I had visited Vidisha regarding matrimony of my younger sister. My host there drove me to Sanchi stupa site unplanned in a gesture of zealous hospitality. Much later in 2011, I discovered on the net that the Stupa complex at Sanchi also houses something called “Shrivats” which means “the great son” (shri-great, vats-son). Was “Shrivats” erected at Sanchi to greet a visitor in the distant future who’d drop in on a compassionate mission in his late father’s shoes? I think yes because compassion begins at home. It was the compassion for my hapless siblings and the widowed mother which had taken me to Vidisha and dozens of other places for the same purpose. An egoless compassion is the core of Buddhism or any other religion. (Search “sanchi shrivats”). My host at Vidisha was a well to do businessman with a tractors’ dealership. I don’t have his name or address now but can recall that he had some close association with the then MP representing Vidisha. I think with a little effort that host can be traced because he was a well known man of the town due to his business and political links. 16. My acquaintances would testify to it that particularly since ’93, my lifestyle has been indistinguishable from that of Alex Zorba – the contented, singing and laughing character. It is unthinkable for a melancholic, insatiate and lusting persona to become a Laughing Buddha. I and many others also believe that my sense of humor is reckonable among the profoundest. It can also be easily confirmed that I’d started behaving “madly” a couple of years ago. I learned only afterwards that a long spell of depression invariably precedes enlightenment. (Proof viewable on ground). 18. As a company employee, I donned the mandatory safety helmet at work. The profile of a work safety helmet resembles a miniature Stupa. My helmet like others has imprinted on it the logo of the employer company-Steel Authority of India Ltd. (SAIL). This logo resembles an ornamental diamond. SAIL is officially recognized among the “Maharatna” (great jewel) companies in India. (Search “Maitreya stupa jewels headdress” and also Google search the image of the logo of the company, Steel Authority of India Ltd.). 19. At home I always sport the Lungi- a piece of fabric casually wrapped around my waist covering down the ankles. I prefer to remain bare chested except in winters. (Search “Maitreya khata”). “Khata” is nothing but the Indian Lungi. In a reckless travesty of the historical truth, Buddha is depicted as a fugitive from life. I, like most others, was fed on this fancy by the ignorant clergy and also the text books beyond which the “educated” class neither knows nor wants to know. As a human fundamentalist I am a man of science, logic, originality, spontaneity etc. and not those unfounded beliefs which hamper the human evolution. I did not believe even in God until only a year ago. I wonder what else the religions aim at if not a blissful and buoyant life through sincere efforts. Maitreya Buddha symbolizes peace, health, wealth, success, joy etc. Every human being is capable (and expected also) to grow in consciousness and enrich the life in all respects by righteous means. A religion ceases to be so if it seeks to throw the human evolution into reverse gear. I am always mindful that salvation from the inherited miseries lies in one’s own hands. To me the true religion is to stay here and take on the challenges instead of prostrating at shrines or cursing the luck. To me spirituality is living a spirited life by being “childish” enough to look and venture beyond. (Search “app deepo bhav”). 21. Lending credence to the native Indian faiths, all the three major Abrahamic religions (Judaism, Christianity and Islam) concur that the End Times or Yawm-al-Qiyamah would be marked by the catastrophic events overtaking the Earth. According to the Mayan Calendar this period is the year 2012 A.D., the time for an instantaneous and worldwide Second Coming. Earthquakes, landslides, floods, tsunamis, hurricanes, meteoric showers etc. striking many parts of the world this year are the telling evidences of the prophesied End Times. Please make relevant searches using the bold italics. 22. Maitreya is prophesied under different names by all major religions of the world. Islam recognizes Maitreya as Mehdi- the Sidrat ul Muntaha who’d rise from the East. (Arab. Sidrat ul Muntaha -fully blossomed lotus/tree). Islamic eschatology also says that Mehdi –the final Imam and a symbol of accomplishment, would have a broad forehead and God will make the provisions for his emergence within a single night. This implies that Mehdi is set to stage a surprise appearance. (“For as the lightning comes from the east and flashes to the west, so also will the coming of the Son of Man be.” ~ Gospel of Matthew 24:27). Also search “Mehdi lot of money rain fruit cattle”. Certainly it’s India in the east and not the Arab lands which is known for “rains”, “fruits” and “cattle”. By the way, I am “Mehdiing” (dyeing) my hair right since the age of 28 which surely is an unusual time to turn all grey. Also, as an aficionado of the Urdu poetry I am among those rare contemporary Indians who are not formally taught Urdu yet can read and write it in the Persian script (Nastaleeq) albeit without the due fluency. Urdu is literally extinct in the part of India where I have been born and living. 23. In numerous Hadiths, Prophet Mohammed has been quoted as saying that Mehdi’s city of birth would be “Karimiah” (Krimiah in medieval Arabic). The English equivalent of Karim is “generous” or “giving”. Sukhavati and Karimiah both certainly are the agnonems of Bhilai given its civic comforts described in a preceding Para. Many Islamic scholars (some of them Arabs too) believe Krimiah to be somewhere in the vicinity of today’s Jaunpur situated in Uttar Pradesh, India. The relevant Hadiths also have it that Mehdi will be born in a home away from public eyes. (Search “krimiah jaunpur mehdi” and also “mehdi birth home away public eye”). As earlier stated I was born in a home not hospital. 24. In hadith 4269 of Sunan Abu Dawud’s Kitab Al Mahdi, Prophet Mohammed is quoted as saying, “Mehdi’s name will be similar to my name and his father’s name will be similar to my father’s.” In this hadith, the word used for “name” is “isma”. Arabic-English dictionaries define isma as name/repute/popularity. In many other languages too, “name” can mean “repute” or even “disrepute” subject to the context. Here the holy Prophet actually refers to Mahdi and his father’s “repute”, not the namesake duos known as “Mohammed” and “Abdullah”. Islamic scholars are confused on this count. 25. Traditionally for the Hindus, lotus is the seat of many deities and has a mystical significance due to its blossoming out of mud. The Hindu scriptures refer to Maitreya as Kalki- meaning “born of mud” (Sans. Kalka-mud). The other suggested meanings of Kalki are “of iron” or “of machine” which augur well with my current job at a steel plant. 26. Kalki is prophesied to ride a white horse. I have so far owned and used four cars at different points of time which were all invariably and impeccably white (search “kalki white horse”). 28. With well developed limbs, a prominent forehead and a bit golden skin, I stand a little taller than the Indian average and my palms exhibit the Abhaya Mudra (the fearless posture). I always sit cross legged in the chair. This is how Buddha had described Maitreya’s physical attributes while addressing Sariputra and the assembly of monks at Shravasti’s Jetavana. (Type these bold italics along with “maitreya” and Google search them). 29. These are my heavenly tushita days because here I have nothing to do and nowhere to go. After booking the house Lotus, I relocated from Surya Vihar to Surya Residency (builder-given names again). Tushita literally means “gratifying” while Surya means Amitabh-The Sun (amit+aabh). Amitabh is one of the many names of Maitreya Buddha. (Search “maitreya tushita” and “amitabh maitreya pure land”). The world has seen many past and contemporary Maitreya-Mehdi claimants over the time. There have been at least two Mehdi contenders in the recent past from India-one from Punjab and the other from the eastern U.P. This is not the first such contention as many would presume. Even Osho had once contemplated himself to be the Maitreya but backed out a few days later. Maitreya prophecy clearly says that he (Maitreya) would present his credentials to the humanity. To my knowledge, the Government of Iran is officially preparing its people to receive Mehdi any time. I wonder if India is toeing the same line by building giant Maitreya statues at Kushinagar, Bodhgaya and elsewhere. Relevant searches will confirm everything mentioned here and I can see no difficulty for any govt. or institution to probe me at my own expense. I won’t be disappointed if I am proven wrong. In that case I’d be relieved of this unexpected and unsolicited role and get back to my own life as usual. Just until over a year ago I had no inkling of what Buddha and the Prophets of other faiths had really meant to the mankind. To me they were somewhat like great saints yet were none of my business. It was only in September 2011 that I turned to the scriptures of different faiths for the first time in my life. I started browsing their pages not out of any piety but to gather information to follow what I had realized with the suddenness of lightning one evening. A situation such as this was never in my wildest imagination. Extremely helpful info particularly the last part 🙂 I care for such information much. Thank you fro reading my blog and for the kind words. hi sir! i saw some other happy buddha that is in milk jade, tigers eye or clear quartz form as a pendant. do they have the same effect or it also involves the stone as well? i’m planning to get the tigers eye. thank you in advance po! good morning!!! where can i get some of your pendant for marriage and wealth enhancer..thank you. Donate! Photo of Fat Buddha, joyful life!